The Tow-Pro™ Elite V2 is an electric brake controller designed to suit most common trailer braking applications whilst requiring minimal dash space and is simple to install and operate. It has now been superseded by the Tow-Pro Elite V3 electric brake controller. The Tow-Pro™ Elite V2 trailer brake controller offers selectable Proportional or User Controlled trailer braking modes allowing the user to choose the braking style depending on the road or terrain conditions, vehicle type, or driver preference. The Tow-Pro™ Elite V2 electric trailer brake controller features Active Calibration which constantly monitors the direction of travel, the unit will even calibrate with no trailer attached whilst maintaining the ability to mount in any orientation. With patented* technology, Tow-Pro™ Elite V2 electric brake controller ensures that no matter the situation, the unit will deliver a smooth, safe trailer braking response. 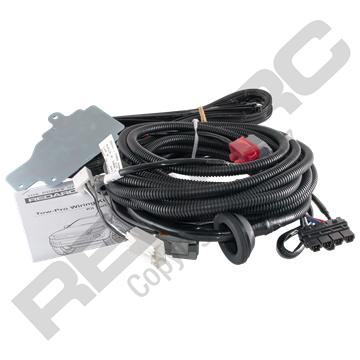 Tow-Pro™ Elite V2 electric brake controller is designed to operate 12V trailer brakes from both 12V and 24V vehicle electrical systems. The acceptable voltage input range is between 9V and 32V. Both braking systems can be operated using Tow-Pro™ Elite V2 electric brake controller requiring no user input to select the mode. * Tow-Pro Elite V2 may not be suitable for some electric/hydraulic systems that require their own specific controller. 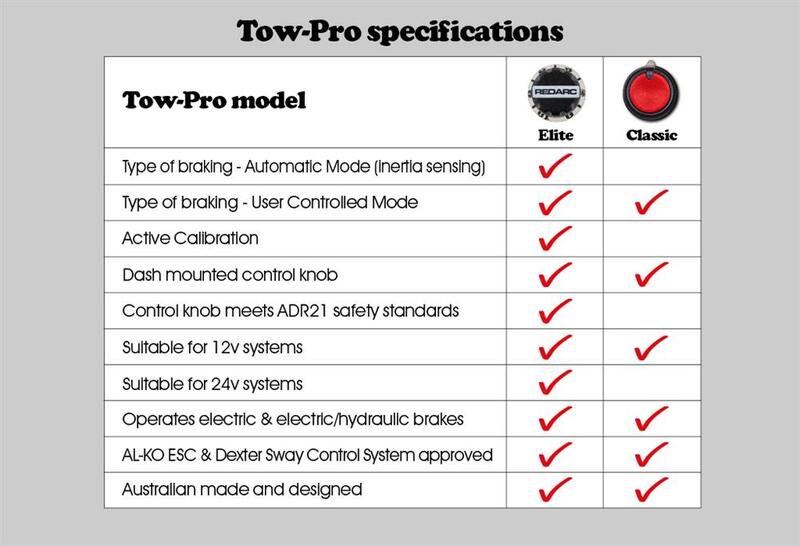 The evolution of the Tow-Pro range of Electric Trailer Brakes has continued with the introduction of Tow-Pro Classic. With two models now in the range, a comparison between the two can be found below. Read about how Tow-Pro works with different electric/hydraulic braking systems. To understand the Active Calibration feature in Tow-Pro Elite, watch the video below. I installed the Elite on my 2015 Ford Explorer. After using the competition, there is comparison. This is the best brake controller I have ever used. I only wish I found Redarc first. plus the ease of installation, you can mount the controller almost any were. Thanks for such a fine product. I have upgraded from a P3 brake controller, I wish I had known about this product before as it is superior than the P3 in operation and I would have saved myself some money. It will be another Tow Pro Elite for my other vehicle. Have been running the Redarc Tow Pro Elite in my 2014 Dmax and found it to be reliable and extemely effective. I did a DIY install and had the job done in under three hours all up. The control dial is unobtrusive on the dashboard, but its very easy to use to change settings on the go (such as manual override of the brakes). Proportional braking makes the trailer very easy to control on uneven terrain and corrugations. This is a great unit and i highly recommend it. Tow pro Elite is "Elite"
Being a novice when it comes to towing vans, campers etc, I had never needed a break controller before. But the camper weighs in at 1600kgs. So a break controller was needed. Installation: My vheicle Y62 Patrol, already has the wiring all ready to go for break controllers, so installation was very quick. The hardest thing was where to install the dial. I decided it had to be somwhere that i could get to easily without having to take away my concentration on the road. Use: Well. I had no idea how these things worked. But a quick read of the instructions, and i was out testing in my street. WOW.. so simple, so easy and it just works. turn dial, push and hold button, select desired settings for manual control or automatic.. The break controller worked perfectly the whole trip and was great to be able to adjust the settings depending on my terrain, from bitumen, to gravel, from sand to 4x4 tracks.